It’s no secret that I love dim sum. I’ve been on a quest to find the best dim sum in Singapore and I’m happy to introduce you to my new favourite dim sum restaurant – Paradise Pavilion at Marina Bay Financial Centre (MBFC). If Taste Paradise is a gorgeous fine dining Chinese restaurant with oriental decorations, Paradise Pavilion would be its westernised sibling, with a stunning French-inspired neoclassical ambience. The restaurant on level 2 of the Marina Bay Link Mall also has an excellent view of the Marina Bay area, making it a great place to watch fireworks. When you ask around which restaurants serve the best Beijing Roast Duck in Singapore, chances are, people will reply either Imperial Treasure Super Peking Duck or Paradise Pavilion. It comes as no surprise as the latter actually constructed the wood fired ovens using apple wood from China. Unfortunately, I didn’t get to try the famous Peking duck as there was only two of us during both visits, so I can’t tell you whether Paradise Pavilion indeed has the best Peking duck in Singapore. But I am getting better at trying new things. I figured that it’s probably quite weird if I go into a restaurant and just order baskets of char siew sou, egg tart, custard bun and nothing else. Under the dim sum menu, there are eight items under “recommended dishes” section, which I believe is a list of dim sum items that are exclusive to Paradise Pavilion. Unless I am mistaken, most of the other dim sum dishes are also available at Taste Paradise. Among them, I’ve tried the Pan-Fried Bun with Sliced Peking Duck, Bacon & Pineapple ($5.6), Siew Mai Skewers ($5.8), Black Truffle Chicken Pie ($6), Sesame Pastry with Sauteed Peking Duck ($6) and Crystal Dumpling with Peking Duck ($4.8). I’d highly recommend the Pan-Fried Bun with Sliced Peking Duck and Siew Mai Skewers. There was silence when the Siew Mai Skewers arrived at the table. Siew Mai on a stick looked mightily impressive. Wow. It tasted even better. The Pan-Fried Bun with Sliced Peking Duck, Pineapple and Bacon was also very good! It was simple, yet very satisfying. My dining companion was quite taken with the Crystal Dumping with Peking Duck ($4.8), but I thought it was a tad too salty. 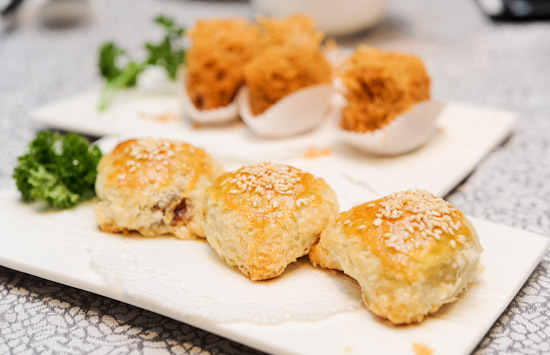 In any case, it is one of the three dim sum dishes that has Peking Duck. From the recommended dishes, the Dragon Beard Flaky Roll with Eggplant ($5.6) sounds really interesting, but we had too much food on both visits, so we skipped that. I like Cheong Fun. Really, I do. But I find it a little disturbing to stuff Cheong Fun with deep-fried veg spring roll ($5.8), so we skipped that and went for the normal Steamed Cheong Fun with scallop filling ($6.3). I know I shouldn’t judge a dim sum by its name, but I thought it was puzzling to list the Original Steamed Carrot Cake ($4.8) as one of the recommended dishes. Maybe the chefs at Paradise Pavilion have found a way to master steamed carrot cake. In that case, shouldn’t they name it as the ‘Best‘ Steamed Carrot Cake instead of ‘Original‘ Steamed Carrot Cake? Another dim sum that came with Peking Duck was the Sesame Pastry with Sauteed Peking Duck ($6). Even though I love duck meat, we couldn’t finish the dish. We were intrigued by the name of the Black Truffle Chicken Pie ($6). I know, we are such superficial creatures. Put anything-black-truffle on the menu and you can get our attention. Sadly, the chicken pie filling wasn’t exactly out-of-this-world good. The puff pastry, on the other hand, was amazing – it felt as though we were in pastry heaven. The Baked BBQ Pork Pastry was good, as expected. I’ve said it before, and I shall say it again – Paradise restaurant has the best char siew sou in Singapore. Paradise’s Steamed Custard Bun ($5.50) is one of the best, if not the best in Singapore. If you haven’t tried the custard buns before, you must make a trip here. yes! i thought of texting you when i tried the custard buns at paradise pavillion. glad u made a trip there too! 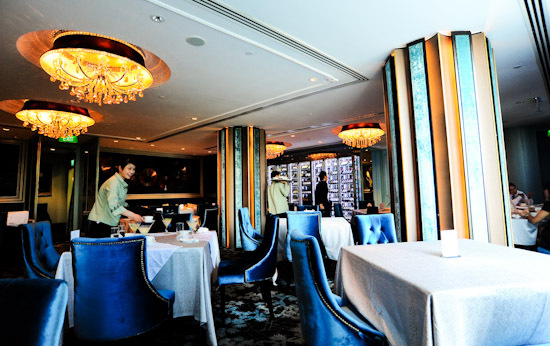 albeit pricey, i think this is one of the poshest, not-part-of-a-luxury hotel place to savor dim sum in town! OMG DROOLS!!! So going there! Eh you went with Cherie and never call us (keropokman, etc)?? I’ve been wanting to come here…looks interesting, some of the dim sum. I have only tried the Peking Duck, which is pretty good. It’s different from Cantonese style. Eldwin pulled over two chefs from Quan Ju De in Beijing. Want to go again? During CNY there was a promotion – consumed S$888 and you will get a can of abalone. Our bill was more than S$1,00-00 and the cashier did not even bother to let us know that there is such a promotion. The question is why didnt she highligt to us so that we can take advantage of the promo? Yes, there is a poster about this on the wall, but how many guests would actually bother to read.